Ask an angler why they fish, and there’s a good chance the answer will simply be “Dad.” For so many of us, the reason we’re avid anglers today is down to our fathers taking us out fishing the day we were old enough to hold a rod (or sometimes even younger). And one of the many joys of being out on the water is reconnecting with those childhood memories. This Father’s day, we want to celebrate the Dads who fish, and also the great role fishing can play in building bonds between grandads, dads and kids, bonds that last a lifetime. Two members of our Heroes pro staff team, Ryan Madara from the R2 Pursuits team in Pennsylvania, and Adam Mamak from Mammoth Outdoors in Canada, share their memories of fishing with their Dads. And as Fathers who fish, they also share their suggestions on fishing with kids and what it means to them. What do you remember about going fishing with your Dad? My Dad always took my brothers and I fishing for the first day of trout on the local streams. It was a tradition at our house. We would wake up hours before it was time to fish and load the van with all the rods, snacks, worms and minnows that we got ready the night before. We also fished some local ponds and a big lake, Raystown Lake, where we would go water skiing when I was young. Do you have any great fishing stories from your childhood? My earliest memory of a successful fishing trip was a time my Dad caught a huge catfish that we kept alive in a cooler after we got rid of all our food and drinks. We brought the big catfish to a pond near our house and released it, hoping to be able to catch him again, although I don’t recall any of us catching him after we put him in his new home. Do you still go fishing with your Dad? Occasionally, when we are up at Raystown Lake, we will get a chance to go fishing, but with 10 grandkids to keep entertained, my Dad is a busy man. Generally, when we get a chance to get away, it’s during hunting season and our time is spent in the woods and not on the water. What role has fishing played in your relationship with your Dad? My Dad taught me and my brothers a lot about the outdoors and much of that information came while standing on the bank of a creek or sitting in one of our boats. We never landed a lot of fish, but we caught plenty of memories. Do you take your kids fishing? I have 3 kids of my own now. I take them fishing as often as I can. My son, who is currently 14 years old, is in love with the outdoors and his biggest passion is fishing. It takes over nearly every conversation we have, regardless of what we are discussing, one of us finds a way to work fishing into the conversation. My youngest daughter is a trout fishing maniac. She is 10 now, but when she was as young as 5 she was tying hooks on the line, and able to take the fish off by herself. At this point, I think she can clean a trout faster than I can. My oldest daughter doesn’t get to go with us as much anymore because she’s very busy with school activities and sports, but when we get the kayaks out or when we are on vacation, she will find time to drop a line in the water with me, and I can tell she still loves it. Do you have any interesting stories about fishing with your kids? Every time we are on the water it’s an adventure. But what may be one of the more memorable fishing moments with my kids was last summer, during our family vacation to Virginia Beach. We went to a local tackle shop, bought a surf rod, tackle, and some bait. Having never done this before we listened to the advice of the local shop owner, then we set out to try our hands at surf fishing. All the kids were able to get in on the action and before the week was over, we had purchased 3 additional surf rods and all landed several different species. But the kids will tell you that the best fights were with some of the large flounder that we caught. What do your kids like about fishing? I believe that they truly enjoy fishing because it’s a chance to be outside. While we all know that kids can be very sedentary these days and with all the technology options in front of them, they may not want to go outside. But once you see their faces light up while fighting a fish on the end of the line – and that includes anything from a small 7-inch trout to a 30 + pound stripper on the Chesapeake Bay – they quickly understand that there is more to life than just sitting in front a TV playing video games or watching other people live life on YouTube. What are the challenges in getting them out fishing? Do you have any recommendations for other parents on how to encourage your kids to take up fishing? Check out my article titled ‘Learning Together’ in the Spring 2018 issue of Bass Angler Magazine. That’s exactly what it’s about. Learning to fish with your kids is a great way to get them involved, just try something that you’ve never done and learn it with them. What has fishing brought to your relationship with your kids? Without a doubt fishing with my kids has allowed us to grow closer. We spend a lot of time together, but when we are fishing, the world seems to slow down. We aren’t rushing to the next school event, or practice, or game, we are just there with each other, enjoying the outdoors and the company of the ones we love the most. “A kid never remembers the good day they had playing video games, but they do with fishing.” Adam Mamak on life as a fishing father. The reason I fish is because of my Dad! Since I was knee high to a grasshopper, I remember fishing with my Dad. Whether it was a kids fishing derby, just hanging out at his friends cottage on Rice Lake, or our trips up to Lake Nipissing, I have very fond memories of fishing with my Dad. It’s one of the main reasons that I take MY kids fishing! Spending time, and making memories! I have two that stick out in my mind. The first was when I was about 8 or 9 at my Dad’s friend’s cottage on Rice Lake. The adults were up in the cottage having some beverages, and all I wanted to do was fish. So I headed down to the dock to wet my line. Only using a hook, worm and bobber, I threw out my line. I could hear my dad’s friend (we called him Skipper!) yelling down to me, “ITS TOO EARLY! !” I proved him wrong! Not long after those words left his mouth, I had a 4 pound largemouth on my line! My dad came down to the dock and helped net him. We actually had that bass mounted, and it’s still on my wall 30 years later. While it wasn’t the largest bass (still a good size! ), it’s the memories that accompany the fish that are really huge! The other story was when I was a teenager. My Dad, Uncle and I were on a fishing trip on Lake Nipissing. We decided to head to the middle of the lake in the rental boat we had for the weekend. After fishing there for an hour or so, we decided it may be a good time to head in as the winds had really picked up, and the lake was getting a lot choppier. By the time we got our lines in and packed up, we started heading back to shore (quite a way away!). Our little rental boat didn’t have much gas, we were not really that experienced in boating this type of weather, and we were heading into the waves so it made for quite a scary ride back. Thankfully we made it to the nearest shore, where the home owner let us tie up the boat, and drove us back to where we were staying. While that story had more to do with survival than fishing, it was one we talk about quite often even after all these years. Unfortunately, I haven’t fished much with my Dad since moving out 15 years ago. Now with my own family, and his schedule, it’s been harder to get together for a fish. However, a few years ago he did organize a fishing charter for salmon on Lake Ontario for him, my eldest daughter Laura, and I. We hooked into quite a few trophy sized kings, and had a great time out on the water. It was my daughter’s first time fishing with her grandpa which made it even more special. My Dad and I have always had a good relationship. Fishing just made it stronger. While I’m sure he didn’t care for the video games we played when we were kids, the one thing we could always agree on was the love of fishing. I have two daughters and definitely take them fishing! 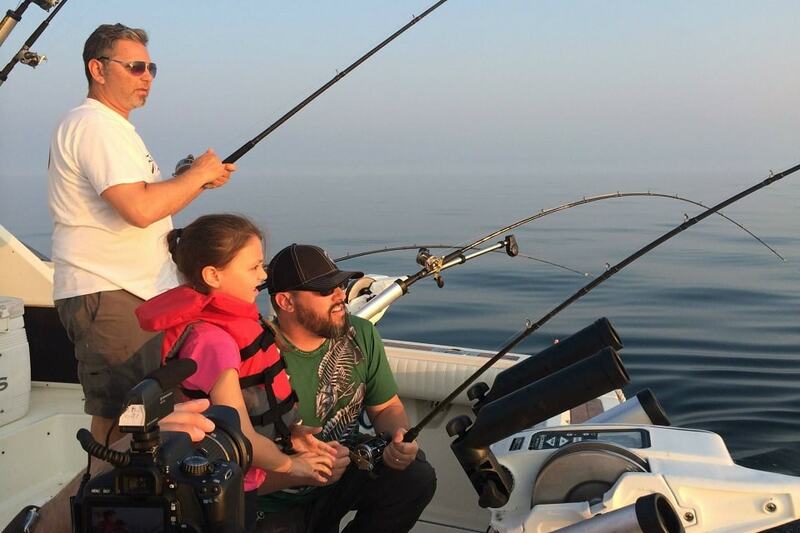 I think my kids love fishing, for the same reason I did at their age – the time spent with their Father. Sure we all have busy lives: school, work, and extracurricular activities. But when we get out fishing, even if it’s for a small amount of time, nothing else really matters! Spending quality time together can be in many forms, and for us ONE of them is fishing. And it’s really true when they say a kid never remembers the good day they had playing video games, but they do with fishing. Well, my eldest daughter Laura had her first experience fishing when she was only 2 and a half years old. And it was on Mother’s Day! We took mom out for a nice breakfast that morning, and asked Laura what else she wanted to do. She answered “Fissing!”. How can you say “no” to that? We hit up a small local lake, and a few casts in with her own rod, she caught her very first rock bass. Needless to say, she was hooked ever since. My other daughter Layla started fishing a little later than her sister. I believe she was about 5 when she got hooked. Heading down to a spot known for panfish, she dug through the container to find the perfect worm, and I put it on her hook. After a quick lesson on casting, she picked it up quite quickly and was absolutely thrilled to catch her first sunfish! We caught quite a few that afternoon, so many that I had to take a quick drive to get more worms! I wouldn’t say it’s necessarily challenging getting the kids out fishing, but they do sometimes prefer to do other things when I ask them to go. I guess the one piece of advice I would give is not to rush it. OK, maybe 2 pieces of advice. The other is start them off small. Usually going for panfish with a worm and bobber is the best way to get them started. Go out for as long as THEY want to be out. Sometimes dragging it on will only make them lose interest in it. Sure we all want the bigger fish. That will come with time! Once they get a feel for have a bite on their line, it’s pretty hard to wipe that smile off their faces. While my kids have always had a good relationship with me, fishing just brings that bond a little closer. Being out on the water gives us time away from everything else, it’s a way to connect differently. With not many other distractions, while we’re waiting for that bite we are able to talk about things that we may not normally talk about.